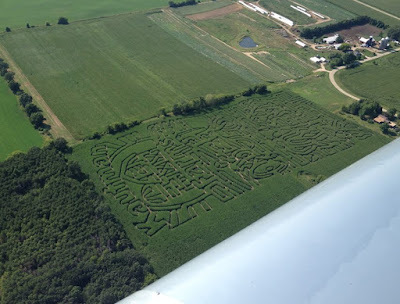 Aerial photo of the maze. Having done a corn maze in the past, I was fairly confident that it would be a fun activity but not too difficult. I hadn't seen this aerial photo previous to starting out. When we arrived there were a lot of activities happening. They have tons of pumpkins, gourds, mums and other plants and produce for sale plus live music and carriage rides. They even had the horses ready for carriage rides. We purchased our tickets and received the map. My other daughter Sarah and one of her sons had joined us. Off we went excited to start. 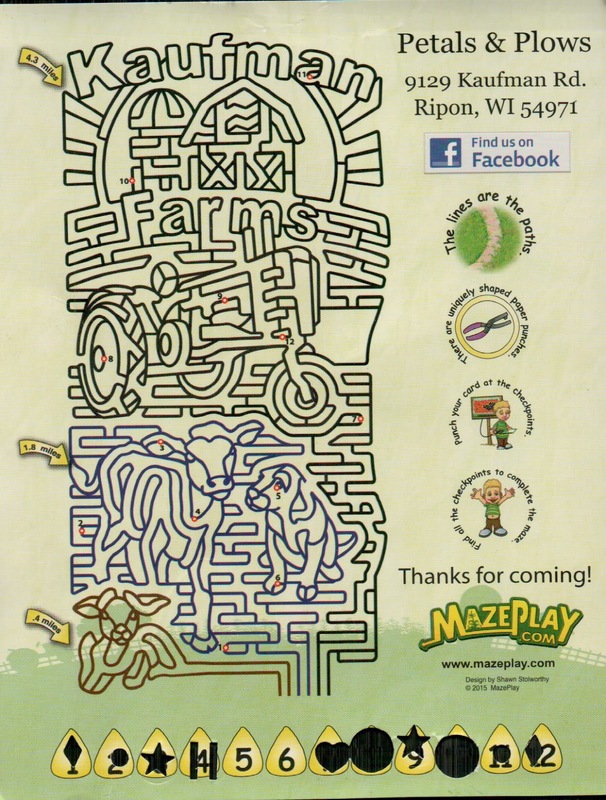 The maze consisted of three sections. 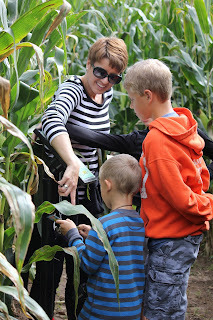 There was a kiddie section, a medium maze and the long one. We thought we should start with the long one. Only later would we realize how long it actually was. If you can read the map, it says 4.3 miles at the far end of the maze. We hadn't read that in advance either. The boys took off leaving us on our own. They would get way ahead and and then come back to check on us. We were struggling from the get go. Being fairly intelligent individuals, we thought we could follow the map. It wasn't long when we realized we were following the white line like they have in all the maze books, and we should have been following the black line. We weren't the only people having trouble. We ran into the same people over and over again. I guess it is called a maze for a reason. It is AMAZING if you ever find your way out. After quite a bit of time, we finally found our way out. I was pretty tired, but the kids wanted to do more. The two big boys took off to the medium maze. Thinking it would be shorter and easier, we thought "why not". We started off fine, but then we got really confused. The sun went under so we couldn't navigate by the sun, the corn stalks were eight feet high so we couldn't see over them and since this was the first day open, we couldn't follow footprints in the dirt. We went around and around. Ewan, our five year old grandson said "I think we're lost, we keep going around in circles". He was right. We managed to get all but two punches but had reached the point of "forget it, get us out of here!". We hadn't brought water because we didn't think this would be such a workout. When we finally emerged, there was Sam and Dylan sitting in the grass waiting for us. 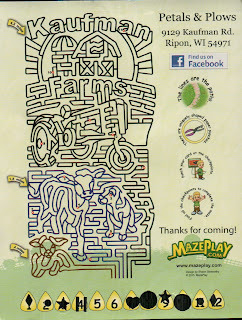 They had not only finished the medium maze, they also finished the kiddie maze. They were grinning from ear to ear. Thank goodness we didn't attempt that small one, or I'm afraid we would really have been humiliated. We are still smiling and in an upright position, so all is well. I was even able to get out of bed this morning. It was an awesome day to remember. Now back to reality. 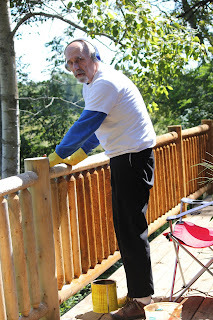 I should really go out and help stain the deck railings but my husband is doing such a great job, I think I will let him enjoy himself. Doesn't he look happy or maybe NOT.